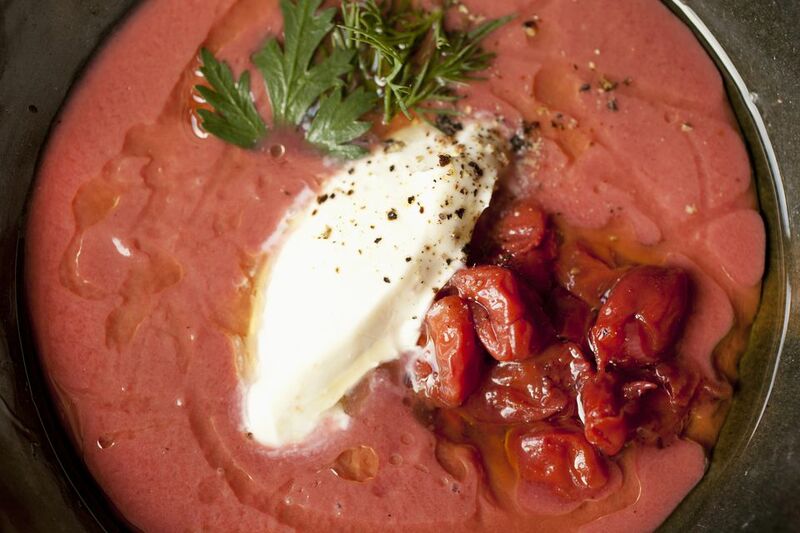 This Hungarian recipe for sour cherry soup goes by many names -- meggy leves, cseresznye leves, meggykeszoce, cibere -- and its sweetness varies with the cook. It's typically served cold in the summer when cherries are plentiful. This soup is traditionally made with tart dark-red Morello cherries, but any tart pie cherry, like fire-engine-red Montmorency cherries, will work in a pinch, as long as they are fresh or at the very least frozen. (Don't use canned.) Never use a sweet Bing cherry. Some recipes call for cinnamon and cloves, with the cherries are left unpitted. Meanwhile, in a medium bowl, mix sour cream with flour, salt, and confectioners' sugar until smooth. When cherries are done, temper the sour cream mixture with a few ladles of hot cherry liquid, whisking until smooth. Transfer to the pan with the cherries and whisk until smooth. Simmer 5 minutes, but do not boil.